A stirring fictional account of the amazing real-life story of John Riley, an Irishman who led his men to desert the American military during the Mexican-American War, as seen through the eyes of two memorable narrators. It is June 1845, and Paddy Quinn is a camp boy for the American army-which, by order of President Polk, is bound for Mexico. A young man with journalistic aspirations, Paddy writes letters for illiterate soldiers and learns that, like him, many are Irish, including the enigmatic John Riley. Riley rattles camp hierarchy when he rails against the brutal treatment of Irish soldiers, but he soon goes further, sneaking away at night to switch sides. Riley is not alone. Fed up with mistreatment and drawn by a Catholic bond, Irish, German, and other soldiers join Mexico. 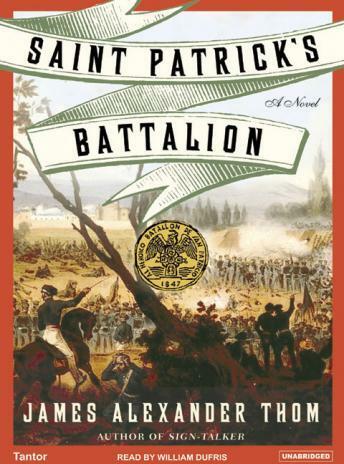 Led by Riley, a corps of Irishman called the San Patricios-in English, St. Patrick's Battalion-fights for the enemy in the war's major campaigns. But when they are captured, their resolve is tested in the extreme-as are Paddy's loyalties, to his country and to the man he most admires. Alternating between Paddy's account and that of Augustin Juvero, a Mexican soldier, nationally bestselling author James Alexander Thom constructs an enlightening novel about war, duty, and loyalty, and draws intriguing parallels to our current conflict in Iraq in his most powerful and relevant novel since Follow the River. Great story about a little known part of American history. The characters are credible and the narrative hangs together well. I wonder why I remember so little about the Mexican War from my history classes. Could it be it was one of our more shameful endeavors that we would like to forget?